UnRetiring: Grandparent Data: What does it Mean? What's it like to unstrap yourself from a lifelong career and launch into the unknown? What choices do you make? What inner voice do you follow? Dotty Brown talks with people on their journey to the next great thing. Grandparent Data: What does it Mean? 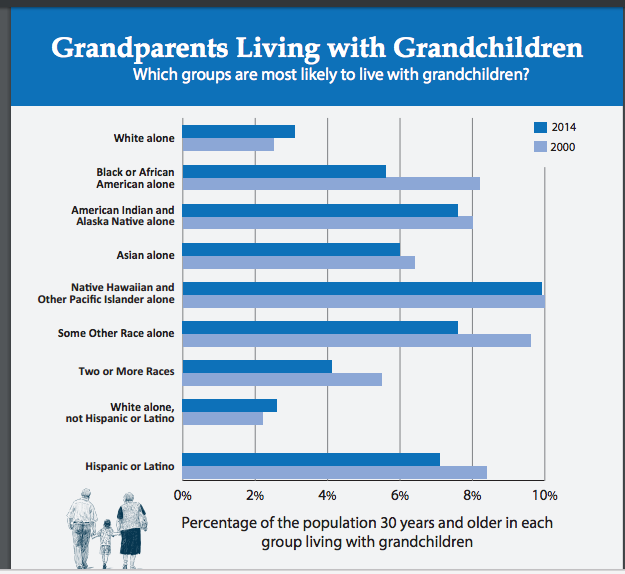 The chart looks at the percentage of adults over age 30 living with a grandchild. Interestingly, between 2000 and 2014, it is only white families that saw an increase in such households with a grandchild. All other groups -- African Americans, Asians, Native Americans, Hispanics -- saw a decline. What does this mean? I remember in the era of crack-cocaine in the 1980s, when more and more minority grandparents were taking in their grandchildren as their own children struggled with addiction. This appears to be the opposite. A Pew study which looked at the numbers of households with grandparents after the 2008 Great Recession also found that while it is still less common for white grandparents to be living with their grandchildren than other groups, the trend is galavanting upwards for whites in particular. According to the Pew study, "While grandparents who serve as primary caregivers for their grandchildren are disproportionately black and Hispanic, the increase in grandparent primary caregiving across the decade has been much more pronounced among whites. From 2000 to 2008, there was a 19% increase in the number of white grandparents caring for their grandkids. So, peering through the windows of America, what does this mean? Any thoughts? "Art Carey" "Young at Heart"
" "conjoined twins" "donald drake"
"Helen Dennis" "Project Renewment" "career women"